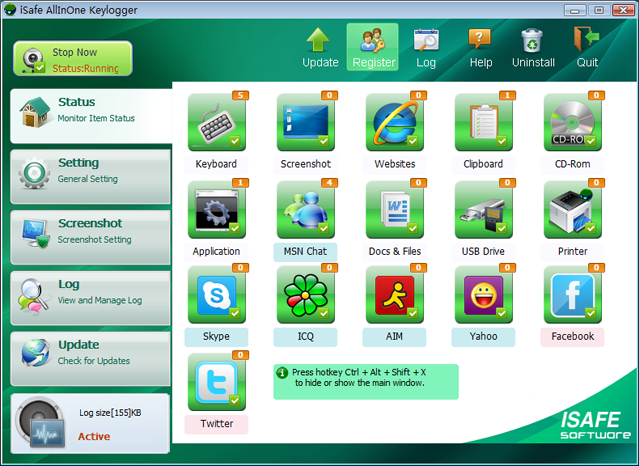 iSafe AllInOne Keylogger lets you monitor and record all activities on your computer, including: screenshots, web sites surfed, all keystrokes, clipboard copyed and pasted, password, application used, IM chatting(MSN,Skype, AIM, Yahoo messenger, ICQ) , Facebook and Myspace used, USB Drive used, CDRom used,Documents printed. It runs in background in totally stealth mode and send logs timely to you email. And logs are generated in HTML format. Qweas is providing links to iSafe AllInOne Keylogger 3. 5.8.199 as a courtesy, and makes no representations regarding iSafe AllInOne Keylogger or any other applications or any information related thereto. Any questions, complaints or claims regarding this application iSafe AllInOne Keylogger 3. 5.8.199 must be directed to the appropriate software vendor. You may click the publisher link of iSafe AllInOne Keylogger on the top of this page to get more details about the vendor.